If there was ever an all around fishing lure, Worden's Original Rooster Tail® is it. 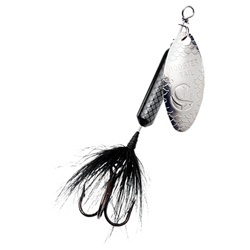 Since the 1950's anglers world wide have been using Rooster Tails to catch just about anything that swims. The Rooster Tail's pulsating hackle tail and attractive spinning action just seems to make fish strike, many times when nothing else will work.